Berlin (AFP) - Chancellor Angela Merkel may appear to be the victor in the Greek bailout standoff but many Germans looked on in dismay at the heavy cost to the country's image. Merkel and her hardline finance minister, Wolfgang Schaeuble, drove a tough bargain at the marathon negotiations, in line with Berlin's stated goal of defending the cause of fiscal rectitude. 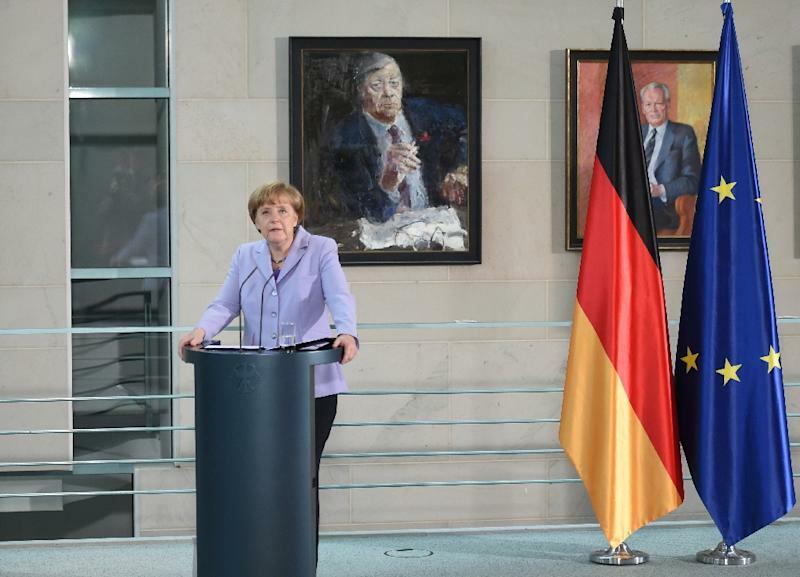 But while Merkel, often called Europe's de facto leader, has grown used to Nazi caricatures on the streets of Athens, a backlash appeared to be mounting this time at home too. Commentators of all political stripes said they feared that Berlin's "bad cop" stance in Brussels had brought back "ugly German" stereotypes of rigid, brutal rule enforcers. "The German government destroyed seven decades of post-war diplomacy on a single weekend," news website Spiegel Online said. "There is a fine line between saving and punishing Greece. This night the line has disappeared," tweeted Mathias Mueller von Blumencron of the conservative standard-bearer Frankfurter Allgemeine Zeitung as the details of the German-brokered austerity-for-aid deal emerged. "Merkel managed to revive the image of the ugly, hard-hearted and stingy German that had just begun to fade," the centre-left daily Sueddeutsche Zeitung wrote. "Every cent of aid to Greece that the Germans tried to save will have to be spent two and three times over in the coming years to polish that image again." 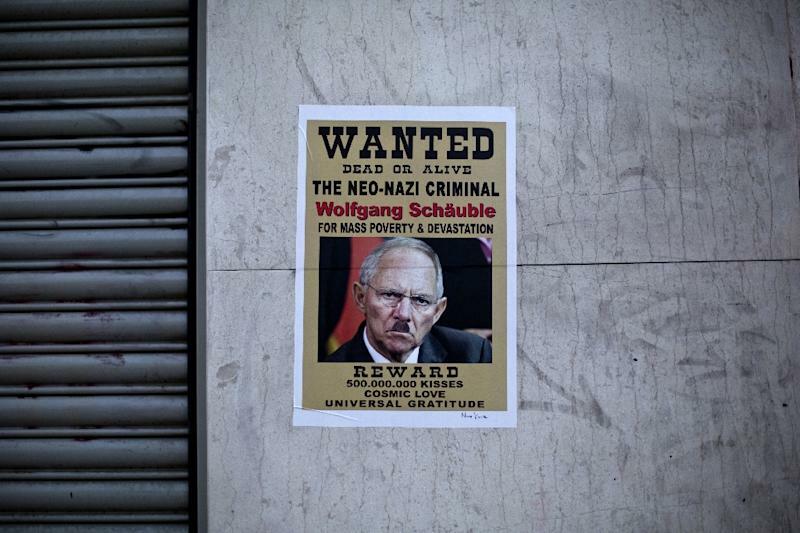 After a shock Schaeuble proposal for a temporary Greek exit from the euro or "Grexit" surfaced over the weekend, spooking Athens and many European partners, the Sueddeutsche asked in an online forum "Is Germany too hard on Greece?" It drew an outpouring of sympathy, along with some criticism, for Athens. Spiegel called the package that was finally hammered out a "catalogue of cruelties" that read like a "plan to humiliate Greece". During the negotiations, two German comedians captured the mood, creating an Internet sensation with a viciously satirical video called "Our precious German euros". The pair mimic loud-mouthed wealthy Germans having a phone conversation in which they simply quote headlines from the powerful pro-Grexit daily Bild. "I think we Germans should be asked if we want to keep paying!" shouts one. "Sell your islands, you broke Greeks... and the Acropolis too!" screams the other. The sketch, which has already been viewed more than one million times on YouTube, ends with the tagline: "This summer, we Germans have a historic opportunity -- not to behave like assholes for once." Nils Minkmar, a German historian and journalist, said that the tortuous series of negotiations with Athens appeared to have been conducted by bean-counters rather than diplomats. "Had someone communicated the German position professionally, then perhaps we would not come off looking so horribly disagreeable," he said on Twitter. "We have squandered an enormous degree of likeability with a communications disaster," said Constanze Stelzenmueller, a German-born fellow at the Washington-based think tank Brookings Institution. Just two years ago, a BBC survey pronounced Germany to be the world's most popular country, with 59 percent of people surveyed around the globe seeing it favourably. In the meantime, Germany's status as an economic powerhouse, gentle diplomatic giant and soccer World Cup champion projected an image of success, a social conscience and even coolness a quarter century after the fall of the Berlin Wall. But former foreign minister Joschka Fischer said the Greek crisis had given rise to a rebirth of nationalism and accused Merkel of failing to use her considerable power to persuade Germans to look beyond their pocketbooks for the sake of Europe. Merkel, who in November will celebrate a decade in power and enjoys nearly 70-percent approval ratings, "has not argued or acted politically but as a bookkeeper", he said. Stelzenmueller agreed that while Germany had many backers in Europe for the tough line it championed with Greece, a lack of apparent empathy had incurred immeasurable damage. "I would have liked the German position to be somewhat more acknowledging of the fact that normal Greeks really have suffered more than others in Europe," she told AFP. "I think there is a great deal of damage done on all sides including to Germany's stance as a benign hegemon." Stelzenmueller said that the horse-trading in Brussels had been "incredibly ugly" and Merkel often seemed to forget she was on the world stage. "One often gets the impression that Merkel is speaking to her own party's backbenchers and for everybody else in Europe it's 'take it or leave it'," she said. Stelzenmueller warned, however, that Germany's unique role in Europe meant that even skilful diplomacy would not ensure its popularity. "I think that's the price of power."